As I write this I’m on the 6.39am train to kings cross and I’m shattered. Gem had a viral throat infection over the weekend so with her having temperature just shy of 39 degrees Celsius, you can understand that I would pay for 8 hours of sleep right now. But I’ve got to prove myself on a pitch for a secondment at 8am and disappointing people left right and centre on other projects I’m on because there aren’t enough hours in the day to do all I’ve got to do. On one project, trying to motivate a dysfunctional team to do the work they are paid to do is draining me at the moment. On another project, the unnecessary politics and the fact that the two girls I love working with on it are on mat leave soon is frustrating as I will miss them much. On a positive note, I’m all booked for my Thai cookery course at The Cooking Academy in July and I’m looking forward to it. There’s got to be more than all this exhaustion and frustration. There’s just got to be more!! It’s been forever since I last put a post out. Absolute yonks!! I miss taking the time to blog. Not only has life been very busy, the longer I left it, the harder it was to actually write anything at all. 1) Gem is a full-on 22 month old toddler. Exciting to be around and fully entertaining. She loves to dance and starts saying “happy” when the Pharell Williams’ song with the same name comes on the radio. 2) On that same toddler note, we have the other “T” word – Tantrums!! They are full on, intense and I can confidently say that “terrible twos” doesn’t necessarily happen from a child’s 2nd birthday. It’s called “terrible twos” because it rhymes, really. For Gem, it started when she discovered she could fall down in a heap whenever she didn’t feel the need to comply. 3) I’ve done some great stuff since being back at work – great projects and also initiatives focused on gender diversity in the workplace, which have been very interesting. 4) Anniversary trip to Hong Kong was totes amaze. 5) I’ve started a new exercise routine at home. Focus T25– really intense and I feel like a million pounds when I’m done with my sessions 6 days a week. 6) I’m growing out my Afro hair. This experience isn’t as straight forward as it sounds. Having old chemically straightened hair and new Afro growth at the same time has tremendous complexities. It also offers tremendous opportunity to look fabulous once I’m fully living with one hair texture. What keeps me going – learning about the hair that I was actually born with so I can know about Gem’s hair. 7) Gem had chicken pox and it was a lot less dramatic than I expected, especially once the spots became visible. 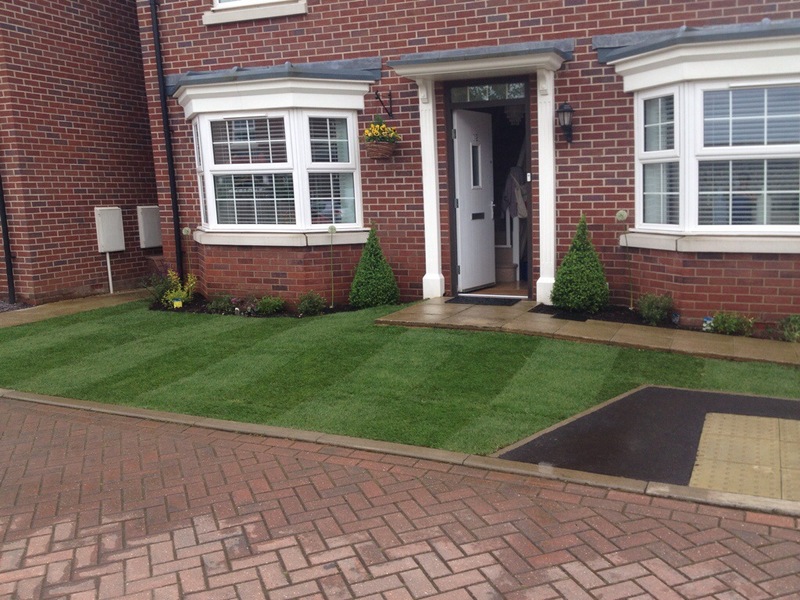 8) Got new turf in our front lawn. 9) Still hoping to find that side hustle that means that I’m not going to work everyday feeling like a “fake”. In other words, finding that thing that I’m born to do. 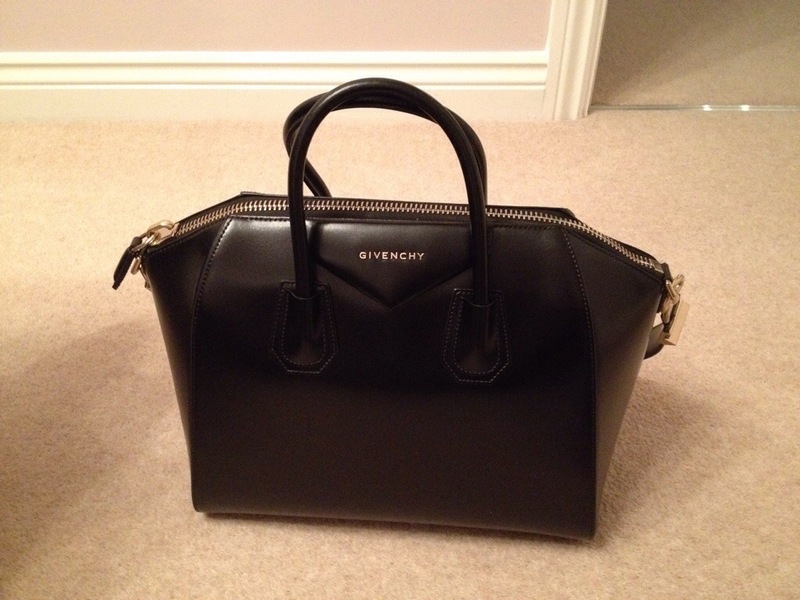 10) Bought the fabulous Givenchy Antigona. Spacious, stunning and I ❤️ it loads. It’s Monday and I’m going to work. I get on the train to work and I think – Wow I’ve got some me-time here. I watch my downloads, I listen to music, I read. It’s my thing, it’s my time! A break from cleaning up Gem’s highchair, mopping floors after Gem’s food-throwing sessions, being a Stepford wife and stressing about whether there’s dust on my white wooden Venetian blinds. It’s also an opportunity to dress up, wear makeup, wear nice shoes and get my hair out of a ponytail every now and again. It’s a break from leggings and a break from ironing. I go to work for a break. Apart from getting a break, I’m enjoying working again. I’ve been working for well over a decade and it’s not until having a child that I realised that I’m built to work. Built to have a deadline, built to challenge myself and built to engage in intellectual discussion. I’ll also say that having a child has put work more in perspective. It’s all not urgent! Nothing will ever feel as urgent as the cry of a newborn saying Feed me NOW or I need to sleep now. My understanding of urgency has definitely shifted. My view on importance is also changed since Gem arrived. Nothing at work is as important as she is and never ever will be. The precious cuddles, the kisses and her toothy grins. 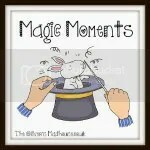 However, it’s Monday, I’m off to work and I’m loving it – a magic moment!! With being back at work, I’ve not been able to put a post out for a while. We’ve had a lot going on with Gem over the last few weeks. We have started the early states of potty training and she seems to be enjoying participating in potty-like activities. In addition, Gem has discovered car door locks and succeeded in opening the door next to her carseat just before we hit the A1M. Apart from the above, we had a party to celebrate her first birthday and it was lovely. 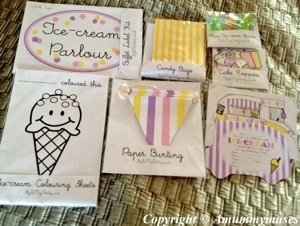 With Stacy McDermott of StyleMyParty.co.uk’s help, we were able to get personalised invites for an ice-cream themed party. I met Stacy on twitter and lord knows, I’m glad I did. She is friendly, creative and extremely generous as she sent tonnes of freebies to us when she sent our order – you can see contents of her package below. We had a wonderful time with a tiered ice-cream themed cake from Hertfordshire’s finest cake maker, my girl Mrs O and the best red velvet cake ever from Sweet Tooth Factoryin Battersea. 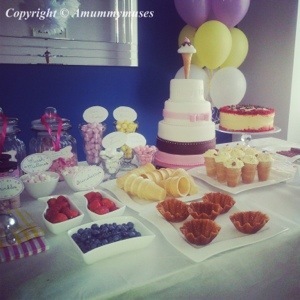 There was tonnes of ice cream cake and ice lollies for the kids and adult-type ice cream as well. All in all, a great day and you can see my display table below, which I’m extremely proud of. This is not a sponsored post – just a shout out for a few great small businesses. It’s been a minute as I’ve not written a post in a while. Things have been quite busy and project abode seems to have taken over every waking minute. 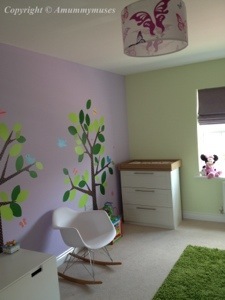 Check out pictures of Gem’s room here. Gem started nursery and loves it. I dropped her off one day and she hit the table in excitement as toast was being served. I worry a lot (as any new mum would) but she seems to have enjoyed her first week. Amidst all this excitement, I start work tomorrow and I am a little nervous. As with a few of my blog posts, I’m writing this as a therapeutic venture and I am setting it out as a pros & cons list. 1) Earning money again – despite being married to a wonderful man, there’s an insecurity and weirdness about having a conversation on spending money when you’re not actually earning any. I know my Louboutin-buying days are very limited now I have a child. However, I want to feel less guilty about getting my little luxuries. 2) Me-time – I will have a dedicated time to catch up on reading, listen to music etc, during my new and longer commute from the sticks. 3) Guaranteed adult conversation – this I am looking forward to. The whole mummy social scene bored me from pretty early on and there were days the only adult I spoke to was ❤Throb. As such, I’m happy to go back to work where my girl Miss H sits next to me and makes me laugh regularly. 4) Using my brain again – I have used my brain in different ways over the last 14 months but it will be nice to spark up those work brain muscles again. 5) Gem’s growth and stimulation – my darling daughter can get to hang out with other kids her age, take part in fun activities and not have to run boring errands with her Mummy. 1) Missing Gem – I will miss my little darling quite a lot. She is developing into a beauty and a fabulous toddler to hang out with. I’ve got Wednesdays off so those will be for Gem hangouts. 2) Longer commute – living in the sticks is great and we are discovering fabulous countryside so no complaints there. However, it will take longer to get to work and although this will give me additional reading and me-time, it will mean having to be well organised to get to pick Gem up from nursery on time. 3) Faking it – the past year has been a steep learning curve in being a mum. However, I know that I’ve never once felt like a fake. Sometimes, in my job, I feel like I will get found out eventually as I don’t believe I’m born to be doing what I do. 4) Exhausted – The sheer exhaustion of being a working mum, resulting in rushing everywhere and not actually doing anything properly. 5) Work-life balance – Will my job and it’s associated expectations fit in sufficiently with my role as wife and mum? I will keep you informed of how I get on. Yesterday, Gem, ❤Throb and I spent the day at the Olympic park watching the 2012 Paralympic stars shine once again in such an amazing setting. I got these Olympic anniversary tickets to celebrate our own one year of being married and it turned out to be a wonderful family outing. Gem was stunned into silence by the sounds, lights and general ambience. She was born a few weeks before it all kicked off last year and although it was great to be able to watch an immense amount of it whilst feeding her or just having her in my arms, I always wondered what it would’ve been like to actually be there and it was truly amazing. 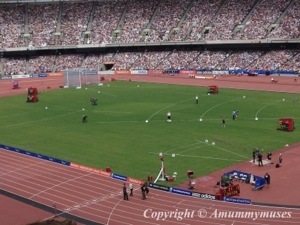 Well done to stars like David Weir, Johnny Peacock, Richard Whitehead and Hannah Cockcroft for giving me and my family a truly magic Sunday.